This altercation took place in 1990 while both parties were working for small-time promotion South Atlantic Pro Wrestling in the Carolinas, long before Shamrock was a world-renowned UFC star. Following the evening's show, Shamrock was sat at a local bar called Funk Crazies with a friend from the ring crew and his girlfriend. Brian Knobbs was sitting at the table next to them, and bean annoying Shamrock by constantly reaching over and grabbing his buddys girlfriend's breasts, upsetting the both of them. Shamrock told him to cut it out, threatening to break his hand if he did it again. They soon got into a skirmish which was quickly broken up by the club bouncers, who took Shamrock into the bathroom to calm down, and ejected the Nasty Boys from the venue. Shamrock was so angry that he couldn't let the issue drop, and he decided to find the Nasty Boys in the motel to finish the fight. He loudly searched for them, giving the tandem due warning that he was coming. When he burst through their door, he saw Knobbs seemingly unconscious on the bed and went for him. Sags tried to break the attack up, but was hurled through a TV set. Shamrock continued to tee off on Knobb's head, but took his eyes off his partner, who cold-cocked him from behind with a telephone, knocking him out. The duo put the boots to Shamrock, breaking his sternum, his eye socket, and giving him a concussion. "They almost killed me," remembered Shamrock. "I actually died in the ambulance going to the hospital. 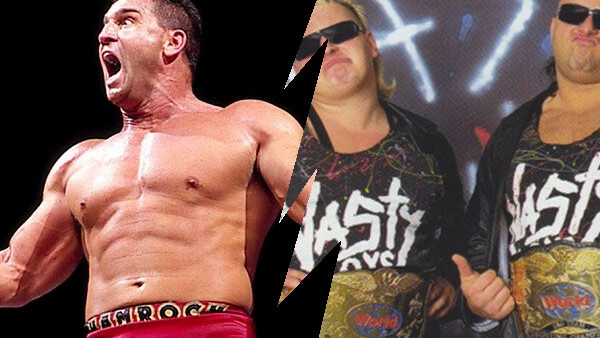 It took me almost a year to recover." Eight years later when the two sides encountered one another in a chance airport meeting for the first time since the fracas, Shamrock was a bona fide Ultimate Fighting legend and active WWF performer, and the Nasty Boys had recently been fired from WCW. Despite the time that had elapsed, Shamrock hadn't forgiven the duo for what they did. He was stood in line with Billy Gunn waiting to check in when he spotted Knobbs sidling up next to him. Gunn realised there was a situation brewing and warned through gritted teeth, "Don't do it, dude." Shamrock didn't pay any attention. Instead, he leaned in close to Knobbs and calmly whispered to him, "I'm going to kill you. " Gunn stepped in and grabbed Shamrock to prevent him ruining his career, and potentially his life, whilst Knobbs realised he was in a precarious situation so high-tailed it out of the vicinity. "You talk about the biggest wimp you have ever seen," says Shamrock. "He had been bragging for years about how they beat me up, and now he was running away from me." Knobbs caught up with his tag partner, who was at the gate catching up with old friends from the WWF. He told him the situation, and Sags loudly voiced, "Whats wrong with Shamrock? He needs a chill pill. He had better watch himself."
He didn't realise that Shamrock was stood right behind him. In a flash, Shamrock jumped over a chair and spun Sags around, yelling so all of the boys could hear, "Im standing right here, you little b*tch. What are you gonna do now? Im gonna kill you, you son-of-a-b*tch." Sags realised an airport was not the smartest place to be fighting, so tried to calm the situation down. Except Shamrock wasn't interested in reasoning with him, but Sags simply turned away before warning, "If you hit me, it is a federal offence. " That calmed the situation down instantly. "At that point, all the anger left my body. He was totally sickening," says Shamrock. "He pussed out in front of everyone, in front of all of the boys. It was kind of satisfying. It was better than anything I could have done to him."
Winner: The Nasty Boys won the physical fight, but Ken Shamrock had the last laugh. The author of the highly acclaimed 'Titan' book series, James Dixon has been involved in the wrestling business for 25 years as a fan, wrestler, promoter, agent, and writer. James spent several years wrestling on the British independent circuit, but now prefers to write about the bumps and bruises rather than take any of them. 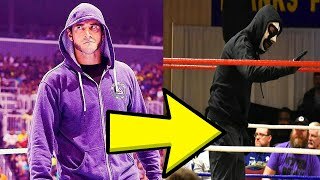 His past in-ring experience does however give a uniquely more "insider" perspective on things, though he readily admits to still being a "mark" at heart. James is the Chief Editor and writer at historyofwrestling.co.uk and is responsible for the best-selling titles Titan Sinking, Titan Shattered, and Titan Screwed, as well as the Complete WWF Video Guide series, and the Raw Files series.